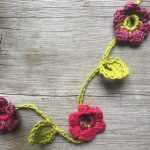 Beautiful Crochet Floral Necklace – A Free Pattern For You! We have a new, free crochet pattern to share with our followers. These beautiful crochet flowers are delicate, detailed and fun to make. They’re the perfect summer accessory, either as a stand-alone piece or several layered together!